I have shifted (most of) my wallet contents into a new minimalist wallet. After seriously considering the Ion minimalist wallet, I ended up going with the Travelambo minimalist wallet. It was one-sixth the cost—cheap enough that I figured I could try it as an experiment, even if I ended up not liking it. Mainly, though, I went with it because it has a transparent window for an ID card on the outside of the wallet. I flash my i-card as a bus pass multiple times per week, and up to now I’ve had to open up my wallet every time to display the card. I’m looking forward to not having to do that just to catch the bus. So far it’s been pretty satisfactory. I’ll update if I end up being especially delighted or disappointed. With that in mind, I thought I’d do a bit of an inventory of my wallet. This post is basically me thinking out loud about what I might be able to slim down. My current wallet has a large currency pocket. I carry my cash there. I also stick receipts in here when I charge something on a credit card. 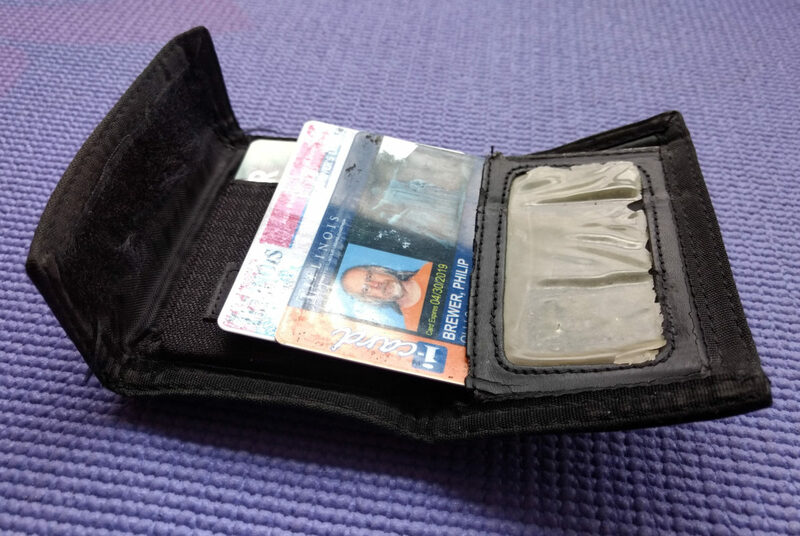 Many minimalist wallets have a money clip instead, which means basically that cash stays outside the wallet. In theory I suppose that lets the wallet itself be smaller, but the clip mechanism is going to take up as much room as the money anyway, so I don’t see how you end up ahead of the game this way. 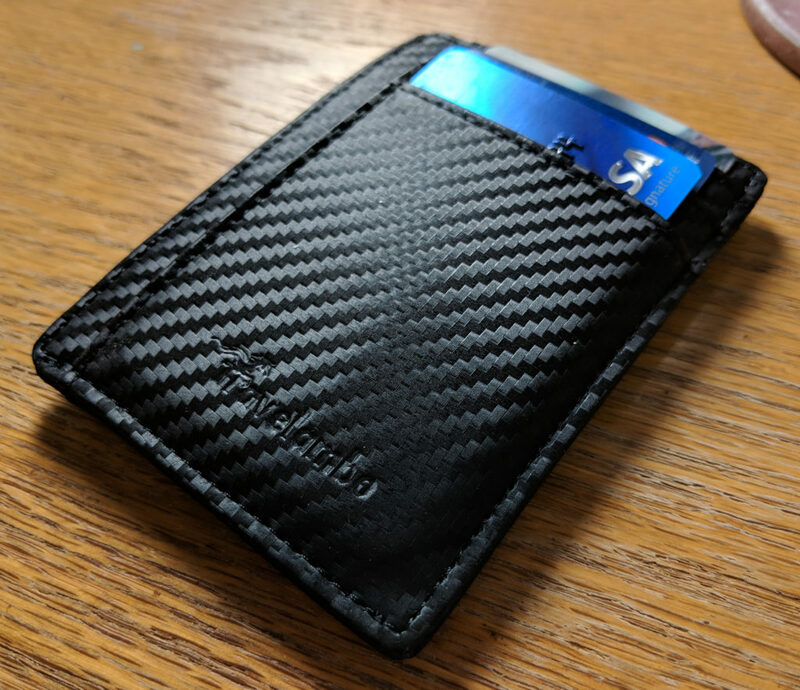 There are three overlapping pockets for cards the size of a credit card, and it is here that I feel a need for some slimming down. Discover card My main credit card. I use it for most ordinary household transactions. MasterCard A backup card. I use it for places that don’t take Discover (which were common 25 years ago when I got the card, but are pretty rare now, except overseas). I also use it when (as has happened twice in the past ten years or so) my Discover card has to be canceled due to fraudulent use. Occasionally it has a cash-back deal that’s good enough that I end up prioritizing it over the Discover card for a month or three. Visa card My personal card. I use this for non-household expenses, such as lunches out, books, magazines, and toys. I also use it when I want to buy Jackie a gift. Schucks card Loyalty card for our local grocery store. Using the card gets me a discount on fuel at the grocery store gas station. AAA card For roadside assistance. AARP card For discounts, etc. Tolono Library card Lets me check books out at the Tolono Library (my address is in the Tolono Public Library taxing district). Also works at the Champaign and Urbana libraries. Illinois FOID card Lets me buy firearms and ammunition in Illinois. Health Alliance card Lets me use my health insurance at health care providers. I have just demoted from that set my American Airlines frequent flier card, which I don’t think I need to carry around, because I don’t think I’ve booked a flight in the past ten years when I wasn’t sitting at my computer. Social Security card (which I’ve been carrying for most of the past forty years, and which is showing some signs of wear). Carle Clinic card (which has my clinic number—used to be important, but nowadays they go by name and date of birth). Voter registration card (which in Illinois you don’t need for voting, but which lists all the precincts and districts that I’m in). But what about all those other cards? Maybe 10 cards is not too many, but it seems like a lot. The FOID card. I haven’t presented to anyone in the past 10 years or so. The AARP card (but I think I’ll keep it in my wallet for another couple of months, because I think I claimed an AARP discount on a hotel room that I’ve booked for an upcoming trip, and might need to show it for that). The AAA card. I’d hate to be without it when I need roadside assistance, but thinking about that prompted me to just now install the AAA app, which has a function for displaying a card image on the phone screen. I can also keep the card in the glove box, so it would be accessible 99% of the times I’m likely to need it anyway. 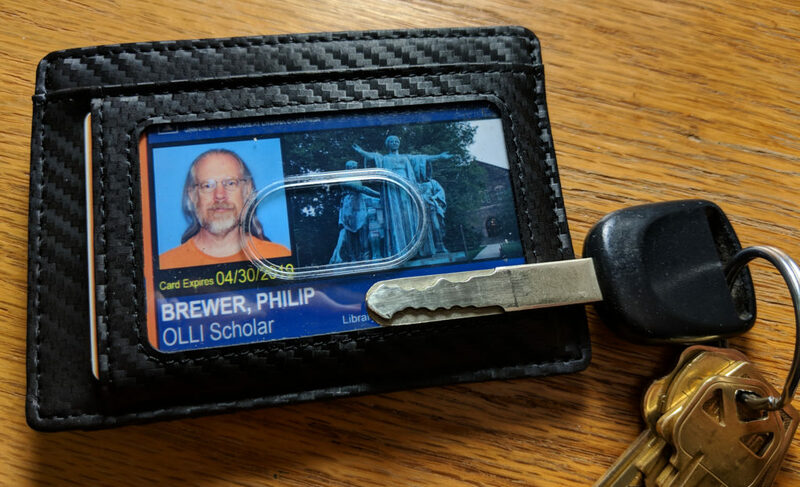 That gets me down to 8 (2 ID cards plus 6 other cards), which is down in the range of many minimalist wallets (including one I have my eye on). Okay. This has, I think, been a useful exercise. I’ll post an update if I learn at some point that I’ve made a terrible error.